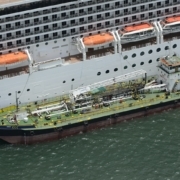 Earlier this year, AMSOL was awarded a five-year Vessel Management contract by the South African Department of Environmental Affairs (DEA)to man, manage and maintain the Antarctic Supply Vessel ‘S.A. Agulhas II’ and Environmental Research Vessel ‘Algoa’. This entails the provision of an efficient crewing, procurement, maintenance and management function, undertaken to international standards – and supports the DEA in fulfilling their mandate in the Antarctica & Islands and Oceans & Coasts departments. 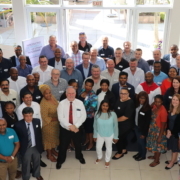 To open the Antarctic season, DEA in partnership with Transnet National Port Authority (TNPA), launched the first South African Antarctica Week on the 3rd December in the Port of Cape Town. 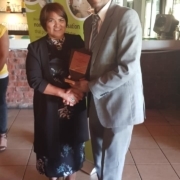 AMSOL participated in this event by exhibiting at the career expo aimed at creating awareness about South Africa’s involvement in Antarctic and sub-Antarctic research as well as the career opportunities in the sector. AMSOL’s Captain Knowledge Bengu, Officers, Crew, researchers and scientists onboard the ‘S.A. Agulhas ll’ departed Cape Town on the 6th December for the annual Antarctic voyage where the team is due to perform several tasks. 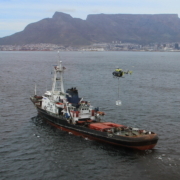 These include the important exchange of personnel, stores and equipment at the South African Government’s SANAE base where an overwintering team are based, as well as climate and oceanographic research. Thereafter scientific research led by the Scott Polar Research Institute to survey marine life of the western Weddell Sea ecosystem will take place before the vessel returns to Cape Town, South Africa in March 2019. 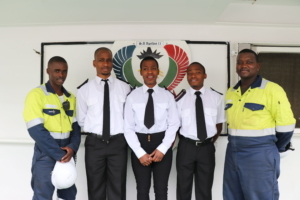 In support of DEA’s objective to utilise the vessel as a platform for training South African seafarers, four AMSOL cadets – Ngqakatha Sakhumzi, Nhlanhla Phakathi, Sphephelo Nkutha and Sanele Mantambo and South African Maritime Training Academy (SAMTRA) cadet Ngcebo Gina joined the ‘S.A. 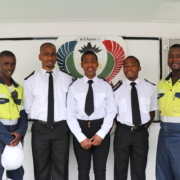 Agulhas ll’ for the Antarctic voyage where they will gain valuable hands on experience under the guidance and membership of the Officers onboard, who play an important role in guiding and mentoring new entrants.